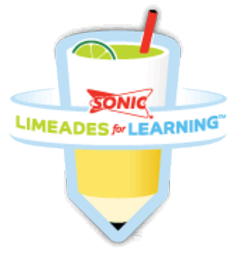 Sonic Drive-Ins are currently involved in their yearly Limeades for Learning campaign. While in previous years, participation was contingent on going to a Sonic and buying a hamburger or tots, this year they have opened a website and are allowing EVERYONE to vote to fund teacher resource projects. Would you believe I have a couple of projects in the running? 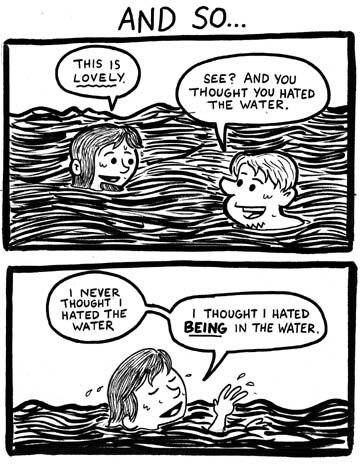 If you’re a longtime reader of the comic, I’m sure you won’t be surprised to find this to be the case. I’m really passionate about building up my classroom’s lending library- I feel it’s a sorely overlooked aspect of most high school classrooms and in the past year I’ve had great success in finding new ways to get exciting, interesting books to my students. I’m hoping to use Limeades for Learning to fund at least one of four projects, including a set of music-themed books, a set of spooky horror themed books, an expansion of my classroom’s graphic novel lending library, and one general reading project. How can you help? It’s crazy-simple. 1. Go to Limeades for Learning and register. It’s the easiest thing in the world to do, just give them your e-mail address and respond to the confirmation e-mail. 2. At the Limeades website, click “Find a Project”. Then go to “Location” and search “Ohio”, then add a Location filter for “Ohio” and the city of Middletown. 3. You’re there! All four Middletown projects are intended for my classroom. You get one vote a day for the next 30 days. 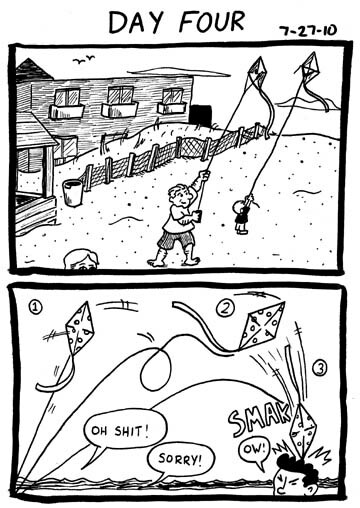 If everybody who reads this comic voted on even half of the days in the month of September, I’d handily win. Right now it looks like “College Bound Students Need New Reading Opportunities” is in the lead, but “Create Lifelong Readers with Graphic Novels” is a particular pet project of mine. I’ve been consistently amazed in the past year and a half at the heartfelt responses I’ve gotten when I’ve asked for help on my little classroom projects like this, so I’d like to thank you all in advance for any time that you can give me. I’ll also beg your forgiveness, as I’m going to be hounding y’all about this for the next few weeks. Just wanted to drop a quick line and let people know that I’m still amongst the living. The 2010-2011 school year is upon us down in Southeast Ohio and I am busy getting to know my students and getting reacquainted with colleagues. 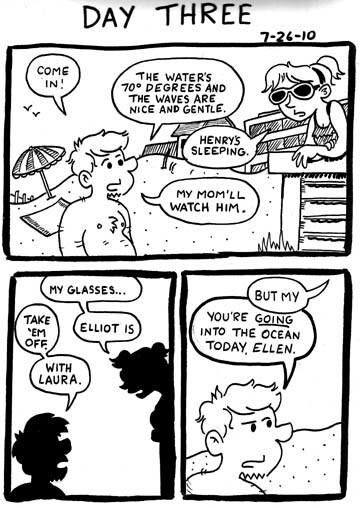 I am looking at a September 7th start date for the comic strip this year, so mark your calendars! I think this is going to be an interesting year for me, career wise… and hopefully that translates to the comic strips I’ll be drawing. Anyhow, thanks to the people who have been checking back here everyday despite the lack of updates. Rest assured, they are on their way. “Soaking” is Elliot’s preferred adjective to describe any extreme state of being covered in something. He has, at various times this summer, been soaking dirty, soaking muddy, soaking hot, and soaking sweaty. Ok, that last one kind of makes sense. I felt like I needed to do an update on yesterday’s comic immediately after I drew it because it seemed I was coming off as a controlling butthead. You could probably change “bad at baby small talk” to just “bad at small talk of any kind.” Honestly, I went into school for the first time yesterday and I couldn’t believe how awkward I was, talking to adults. That’s what an entire summer of talking to/with a 2 year old’ll do to ya. You are currently browsing the Teachable Moments blog archives for August, 2010.